High mobility group box 1 (HMGB1) is a highly conserved protein with multiple intracellular and extracellular functions, including transcriptional regulation, as well as modulation of inflammation, cell migration, and ingestion of apoptotic cells. In these experiments, we examined a potential role for intracellular HMGB1 in modulating phagocytosis. We found that phagocytosis of apoptotic cells resulted in translocation of HMGB1 into the cytoplasm and extracellular space. Transient or stable inhibition of HMGB1 expression in bone marrow-derived macrophages or fibroblasts resulted in increased phagocytosis of apoptotic thymocytes and apoptotic neutrophils. Knockdown of HMGB1 was associated with enhanced activation of Rac-1 and cytoskeletal rearrangement. 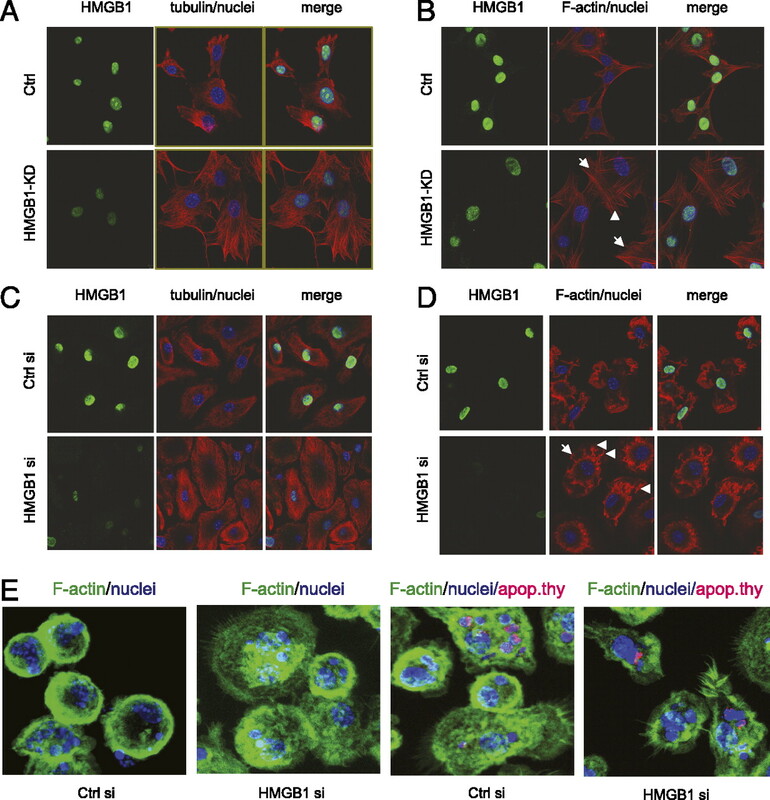 Intracellular events involved in phagocytosis and upstream of Rac-1 activation, such as phosphorylation of ERK and focal adhesion kinase (FAK), were increased after knockdown of HMGB1. Inhibition of Src kinase activity prevented the increase in phosphorylation of FAK and ERK present during phagocytosis in HMGB1 knockdown cells, and also abrogated the enhancement in phagocytosis associated with HMGB1 knockdown. Interaction between Src and FAK in the cytoplasm of HMGB1 knockdown fibroblasts was enhanced compared with that present in control fibroblasts. Under in vitro conditions, the presence of HMGB1 diminished interactions between purified FAK and Src. These studies demonstrate a novel role for HMGB1 in the regulation of phagocytosis. In particular, these experiments show that intracellular HMGB1, through associating with Src kinase and inhibiting interactions between Src and FAK, diminishes the phagocytic ability of macrophages and other cell populations. Phagocytosis is a critical mechanism that enables cells of the innate immune system to ingest and eliminate microbes, apoptotic cells, and other foreign particles (1–4). Phagocytosis is initiated by binding of specific ligands present on the microbe, apoptotic cell, or particulate material to cognate receptors on the phagocyte that then initiate signaling cascades leading to the polymerization and rearrangement of F-actin that coordinate tractional forces leading to internalization of the particles (5–8). High mobility group box 1 (HMGB1) is a highly conserved protein with multiple intracellular and extracellular functions. Nuclear HMGB1 was initially characterized as an architectural chromatin-binding factor that bends DNA and promotes protein assembly at specific DNA targets (9). More recently, an extracellular role for HMGB1 has been described in which HMGB1 acts as a signaling molecule during inflammation, cell differentiation, cell migration, and tumor metastasis (9, 10). HMGB1 is released from necrotic and apoptotic cells, and is secreted by activated macrophages, NK cells, and dendritic cells, where it participates in the response to infection, injury, and inflammation (11). HMGB1 contains two homologous DNA-binding motifs (HMG boxes A and B) and an acidic tail (12). 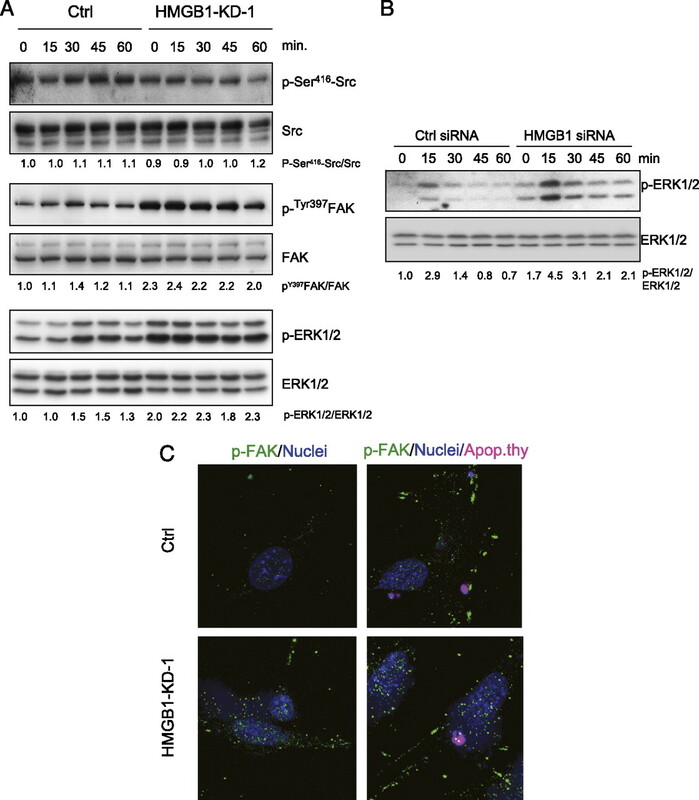 There are also two nuclear localization signals, as well as two putative nuclear export signals within the molecule (13, 14), suggesting that HMGB1 shuttles between the nucleus and the cytoplasm. Recent studies have shown that posttranslational modifications of HMGB1 participate in its translocation from nucleus to cytoplasm, as well as secretion by inflammatory cells. In particular, hyperacetylation and phosphorylation of HMGB1 lead to its cytoplasmic localization in macrophages, and monomethylation at Lys42 appears to be associated with nuclear-to-cytoplasm translocation of HMGB1 in neutrophils (13–16). 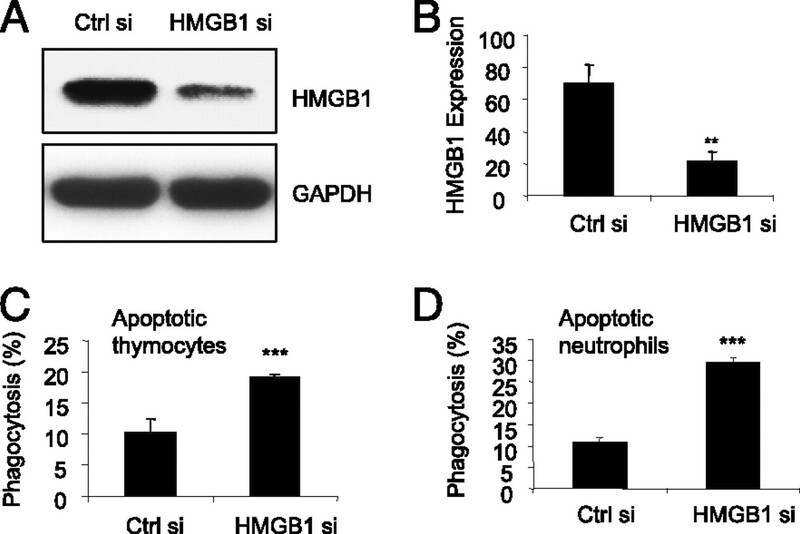 Incubation of macrophages with HMGB1 leads to diminished uptake of apoptotic neutrophils, with the C-terminal acidic tail of HMGB1 being required for this effect (17–19). Despite the capability of extracellular HMGB1 to diminish efferocytosis, there have been no reports concerning the role of intracellular HMGB1 on phagocytosis. Of note, it has recently been shown that cytoplasmic HMGB1 regulates autophagy (20). Because intracellular events associated with autophagy can also affect phagocytosis (21), the association of HMGB1 with autophagy suggests that intracellular HMGB1 may have a role in phagocytosis. In these experiments, we examined the potential participation of intracellular HMGB1 during phagocytosis and found that intracellular HMGB1 inhibits cytoplasmic events, including interactions between Src and focal adhesion kinase 1 (FAK1), as well as FAK1 phosphorylation, that are associated with phagocytosis. Our studies also demonstrate an important functional role for intracellular HMGB1 in diminishing the phagocytic activity of macrophages and other cell populations. Male C57BL/6 mice were purchased from National Cancer Institute Frederick. Mice were housed and studied at the University of Alabama at Birmingham using Institutional Animal Care and Use Committee-approved protocols. Experiments were performed using 8- to 10-wk-old mice. Custom mixture Abs and negative selection columns for neutrophil isolation were from Stem Cell Technologies. PKH26 Red Fluorescent Cell Linker Kit was from Sigma-Aldrich. pHrodo succinimidyl ester was from Invitrogen. Microcon YM-10 was from Millipore. HMGB1 ELISA kit was from IBL International. Rac1 G-LISA kit, to determine Rac1 activation, was from Cytoskeleton. Src kinase inhibitor PP2 was from Calbiochem. FITC-conjugated anti-CD11b Abs were from BD Biosciences. Polyclonal Abs against FAK (c-903), pY397FAK, GAPDH, HDAC-1, and c-Src, as well as mouse mAb against c-Src, were obtained from Santa Cruz Biotechnology. Affinity-purified rabbit polyclonal Abs to pY416Src, as well as to pT180–Y182p38, pT202–Y204p44/42 (p-ERK1/2), pT183–Y185JNK, p38, ERK1/2, and JNK were purchased from Cell Signaling Technology. Mouse monoclonal HMGB1 Ab was from R&D Systems. Alexa Fluor 594 phalloidin, Alexa Fluor 488 phalloidin, Alexa Fluor 594-, and Alexa Fluor 488-conjugated secondary Abs were from Invitrogen. HRP-conjugated goat anti-rabbit and anti-mouse IgG (H+L) were from Bio-Rad. HRP-conjugated mouse anti-rabbit L chain-specific IgG was from Millipore. Goat anti-mouse IgG (γ-chain specific) was from Southern Biotech. Mouse fibroblast (NIH3T3) cells and CCL-1 (American Type Culture Collection, Manassas, VA) were maintained in RPMI 1640 containing 10% FBS. Small interfering RNA (siRNA; sequence: 5′-UGCUGCCUACAGAGCUAAA-3′) targeting mouse HMGB1 and a control siRNA with scrambled sequence were purchased from Dharmacon. A short hairpin RNA construct was made in pBabeH1 vector (pBabeH1-HMGB1) using the same sequences. The pBabeH1 vector was kindly provided by Dr. Xinbin Chen (University of California, Davis, Davis, CA). Bone marrow-derived macrophages (BMDMs) were transfected with siRNA using RNAiMAX Reagent (Invitrogen) according to the manufacturer’s instructions. After 72 h of transfection, the cells were used for further experiments. Stable NIH3T3 cell lines with significant downregulation of HMGB1 were generated by transfection with pBabeH1-HMGB1 plasmid DNA using Lipofectamine 2000 reagent (Invitrogen) followed by selection with puromycin (2 μg/ml). CCL-1 conditioned media were prepared as previously described (22). BMDMs from C57BL/6 mice (male, 8–10 wk old) were cultured as previously described (22, 23) with modifications. In brief, bone marrow cells devoid of RBCs were cultured in BMDM media containing RPMI 1640 with 1×Glutamax, 1×Na-Pyruvate (Life Technologies), 10% CCL-1 conditioned media, and 10 ng/ml GM-CSF (PeproTech) overnight. Nonadherent cells were collected and 1 × 107 cells per 150-mm plate were plated in BMDM media. After 5 d of incubation, BMDMs were collected from the plates by scraping. Cells were cultured in GM-CSF–free RPMI complete media for 24 h before phagocytosis assays were performed. Murine thymocytes were resuspended in RPMI 1640 containing 10% FBS and 1 μM dexamethasone at a concentration of 1 × 107 cells/ml and incubated at 37°C in 5% CO2 for 12 h. At this time point, >90% of the thymocytes was apoptotic, as demonstrated by Annexin V and propidium iodide staining. Viable and apoptotic thymocytes were stained with PKH26 or pHrodo fluorescent dye according to the manufacturer’s instructions. BMDMs (50 × 104 cells/well) or NIH3T3 cells (20 × 104 cells/well) were plated in 12-well plates. After 24 h of incubation, the cells were exposed to PKH26-labeled apoptotic thymocytes resuspended in RPMI medium containing 10% FBS (1 h). The ratio of phagocytes to targets was 2:1. Uningested cells were removed by washing five times with ice-cold PBS. Cells were harvested in PBS containing 1% BSA, and phagocytosis (%) was determined by flow cytometry. In the case of BMDMs, the cells were counterstained with FITC-CD11b Ab. In vitro phagocytosis assays using apoptotic neutrophils were performed as described previously (17). BMDMs or NIH3T3 cells were grown on coverslips, then fixed with 4% formaldehyde in PBS for 10 min. After being washed with PBS and blocked with 5% BSA in PBS, the cells were incubated overnight at 4°C with the primary Abs. After being washed three times, the cells were incubated with Alexa Fluor 488- or Alexa Fluor 594-conjugated secondary Abs for 1 h at room temperature. The coverslips were then mounted on slides, and the localization of proteins was examined with a confocal microscope (Nikon). Cell lysates of NIH3T3 mouse fibroblasts were incubated with anti-Src Ab (2 μg) or anti-HMGB1 Ab (2 μg) overnight. Immunocomplexes were precipitated by incubation with protein G-agarose beads for 2 h. Cell lysates incubated without Abs but with protein G-agarose beads were used as a negative control. Immunocomplexes were resolved by PAGE gel and transferred to polyvinylidene difluoride membranes. The membranes were blotted with Abs for HMGB1 or Src, followed by HRP-conjugated secondary Abs specifically targeting IgG H or L chains. Flag-tagged HMGB1 protein was purified from an HEK 293T cell line that stably expressed HMGB1-Flag, as described previously (17). Recombinant FAK1 Myc protein (OriGene Technologies) and Src-GST (Sino Biological) were obtained commercially. Proteins at the indicated concentrations were added to 1 ml Buffer A (50 mM Tris [pH 7.5], 150 mM NaCl) containing 5% glycerol followed by addition of glutathione beads. The mixtures were then incubated at 4°C with continuous stirring for 1 h, after which the beads were washed three times with Buffer A containing 0.5% Nonidet P-40. Src-bound HMGB1 or FAK1 was analyzed by immunoblotting with specific Abs to Flag or Myc. Data are presented as means ± SD for each experimental group. One-way ANOVA followed by the Tukey–Kramer test for multiple groups or Student t test for comparisons between two groups was used. A p value <0.05 was considered to be statistically significant. Although HMGB1 was originally described as an intranuclear DNA-binding protein, recent studies have shown that HMGB1 can translocate from the nucleus to the cytoplasm and then into the extracellular space in response to TLR ligation, as well as after oxidative, metabolic, and other stress (13, 14, 24–27). In our previous study (17), we found that extracellular HMGB1 inhibits the phagocytosis of apoptotic neutrophils and thymocytes by macrophages. However, there is no information about the effect of efferocytosis on the localization of intracellular HMGB1, nor are there data concerning the role of intracellular HMGB1 in the regulation of efferocytosis. To determine whether efferocytosis affects the intracellular localization of HMGB1, BMDMs were incubated with or without apoptotic thymocytes, washed to remove noningested cells, cultured for an additional 3 h, and then the levels of HMGB1 in the supernatants determined by Western blotting. As shown in Fig. 1A, whereas only minimal concentrations of HMGB1 were found in supernatants from macrophages not exposed to apoptotic thymocytes, HMGB1 levels in the supernatants from macrophages cultured with apoptotic cells were markedly increased. We used ELISA analysis to determine the levels of HMGB1 in the supernatants from macrophages at different time points after ingestion of apoptotic thymocytes. As shown in Fig. 1B, extracellular release of HMGB1 after phagocytosis of apoptotic cells was an early event, occurring within 1 h of exposure of macrophages to the apoptotic thymocytes, and then further increasing over the next 2 h.
Phagocytosis is associated with increased cytoplasmic and extracellular levels of HMGB1. A and B, BMDMs were incubated with apoptotic thymocytes for 1 h. The macrophages were then washed four times to remove uningested cells and cultured in Opti-MEM media for 0, 1, 2, or 3 h. Levels of secreted HMGB1 were determined by Western blot analysis (A) or by ELISA (B). C, BMDMs were incubated with or without pHrodo-labeled apoptotic thymocytes (red fluorescence) at 37°C for 1 h on a chamber slide. The cells were then washed to remove uningested cells. The macrophages were fixed at 0, 1, or 3 h after phagocytosis. Intracellular localization of HMGB1 (green fluorescence) was determined by immunofluorescence. DAPI was used to stain nuclei (blue fluorescence). Representative experiments are shown. Two additional independent experiments provided similar results. ***p < 0.001 as compared to efferocytosis at 0 h.
Given that HMGB1 is primarily localized to the nucleus under basal conditions, the increase in extracellular HMGB1 concentrations after phagocytosis suggests that ingestion of apoptotic cells by macrophages results in HMGB1 translocation from the nucleus to the cytoplasm and subsequently to the extracellular space. To demonstrate such transitions in the location of HMGB1, we performed immunofluorescent microscopy with macrophages that had been incubated with apoptotic thymocytes. As shown in Fig. 1C, although there was detectable HMGB1 in the cytoplasm of resting macrophages (Fig. 1C, first column), cytoplasmic HMGB1 was increased in macrophages after ingestion of apoptotic cells (Fig. 1C, second and third columns). 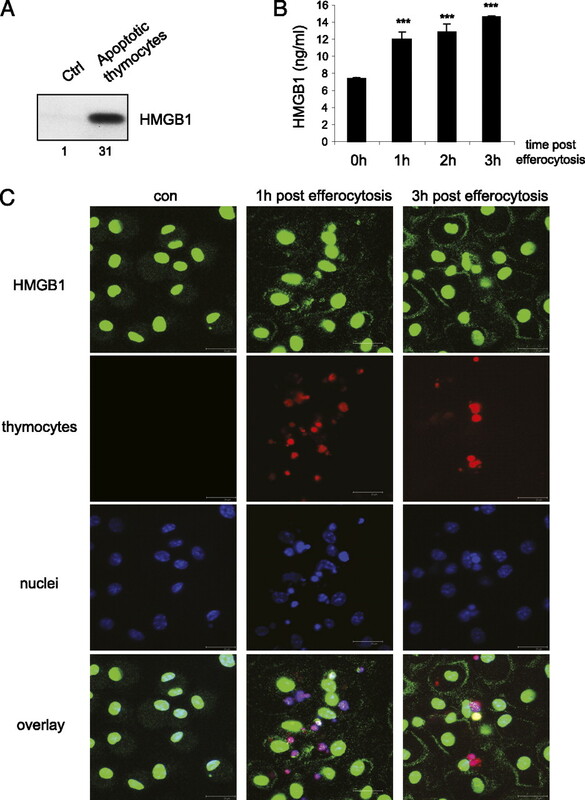 Noticeably, some HMGB1 was also enriched on the cell membrane after efferocytosis, suggesting that efferocytosis induces translocation of HMGB1 from the nucleus to cytoplasm, and subsequently to the extracellular milieu. The enrichment of HMGB1 on the cell membrane was more evident at 3 h after phagocytosis, consistent with ongoing secretion of HMGB1 by macrophages after ingestion of apoptotic cells. Given our results showing that cytoplasmic and extracellular HMGB1 is increased after phagocytosis, we hypothesized that HMGB1 may play a role in the regulation of phagocytosis. To examine this issue, we transfected BMDMs with either control siRNA or siRNA to HMGB1 and then determined the phagocytic activity of the cells. HMGB1 siRNA effectively diminished HMGB1 expression in BMDMs (Fig. 2A, 2B). As shown in Fig. 2C and 2D, BMDMs transfected with HMGB1 siRNA demonstrated significantly enhanced phagocytic activity for apoptotic neutrophils and apoptotic thymocytes. HMGB1 knockdown enhances the phagocytic activity of macrophages. A, BMDMs were transfected with control siRNA (Ctrl si) or HMGB1-specific siRNA (HMGB1 si). Three days after transfection, the cells were collected and HMGB1 expression determined by Western blotting. A representative Western blot is shown. Two additional independent experiments provided similar results. B, Densitometry of intracellular levels of HMGB1 from the Western blots in A. C and D, BMDMs were transfected as in A. Phagocytosis was determined after the cells were incubated with apoptotic thymocytes (C) or apoptotic neutrophils (D). Results (means ± SD) from three independent experiments are shown. **p < 0.01, ***p < 0.001 as compared to Ctrl si groups. To determine whether the inhibitory effect of HMGB1 on phagocytosis is present only in BMDMs or is a general phenomenon, we generated NIH3T3 fibroblasts in which intracellular concentrations of HMGB1 were stably reduced. NIH3T3 fibroblasts are not professional phagocytes, but they have been used to study mechanistically efferocytosis in previous studies (28, 29). The stable HMGB1 knockdown NIH3T3 fibroblasts had substantially less HMGB1 expression compared with NIH3T3 fibroblasts that were transfected with empty vector (Fig. 3A, 3B). A control NIH3T3 fibroblast clone that was transfected with the vectors expressing HMGB1 siRNA, but without obvious HMGB1 knockdown, was also selected as a control (Fig. 3A, 3B). We found that the NIH3T3 fibroblasts with decreased HMGB1 expression demonstrated significantly enhanced phagocytic activity with respect to uptake of apoptotic thymocytes (Fig. 3C). HMGB1 knockdown enhances the phagocytic activity of mouse NIH3T3 fibroblasts. A, A NIH3T3 fibroblast line that was stably transfected with the empty vector, pBabe-H1 (Vec), two NIH3T3 fibroblast lines that were stably transfected with the HMGB1 siRNA-expressing vector, pBabe-H1-HMGB1 (HMGB1-KD-1 and HMGB1-KD-2), and one NIH3T3 fibroblast line that was stably transfected with pBabe-H1-HMGB1, but with minimal HMGB1 knockdown (Ctrl), were selected for the phagocytosis assays. Levels of HMGB1 were determined by Western blotting. A representative Western blot is shown. Two additional independent experiments provided similar results. B, Densitometric analysis of the levels of HMGB1 in A. C, Phagocytosis was determined after the NIH3T3 fibroblast lines were incubated with apoptotic thymocytes. Results (means ± SD) from three independent experiments are shown. **p < 0.01, ***p < 0.001. Interaction and engulfment of targets by phagocytes activates Rac-1, a small GTPase that modulates cytoskeleton rearrangement associated with phagocytosis (6, 30–35). Given our findings that knockdown of HMGB1 enhances phagocytosis, we next examined whether intracellular HMGB1 has a role in the activation of Rac-1. In these experiments (Fig. 4), control NIH3T3 fibroblasts and stable HMGB1 knockdown NIH3T3 fibroblasts were incubated with or without apoptotic thymocytes; then Rac-1 activity was determined. 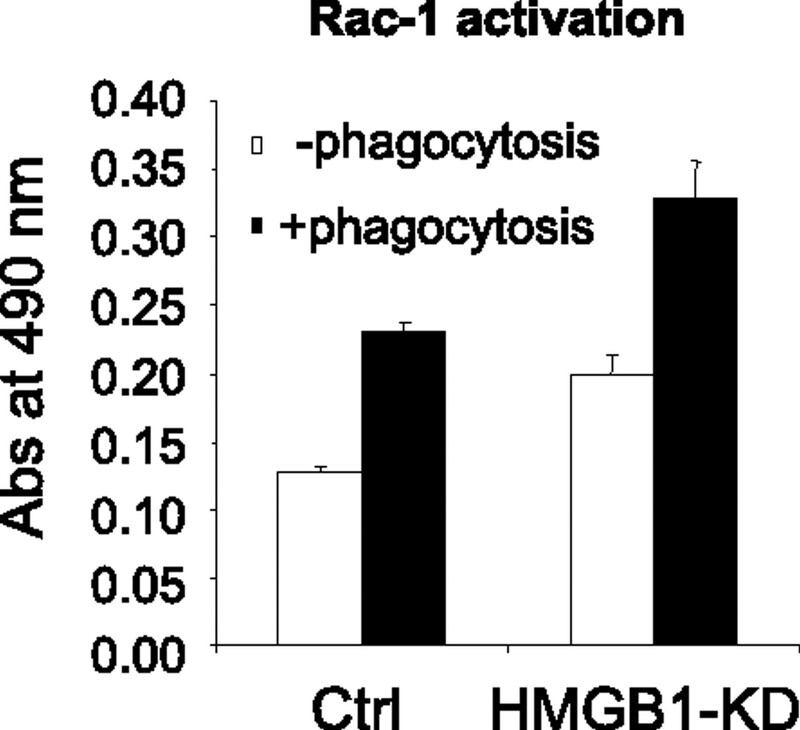 HMGB1 knockdown enhances activation of Rac-1. NIH3T3 cells transfected with pBabe-H1-HMGB1, but with minimal HMGB1 knockdown (Ctrl), and NIH3T3 cells with HMGB1 knockdown (HMGB1-KD) were incubated with or without apoptotic thymocytes for 20 min; then Rac-1 activation was determined. Results (means ± SD) from two independent experiments are shown. Rac-1 activity was increased in control NIH3T3 fibroblasts after exposure to apoptotic thymocytes, as compared with that present in control NIH3T3 fibroblasts that had not been incubated with apoptotic thymocytes (Fig. 4). We also found increased Rac-1 activity in HMGB1 knockdown cells, as compared with that present in control fibroblasts, both before and after incubation with apoptotic thymocytes. These data suggest that intracellular HMGB1 is a negative regulator of Rac-1 activity under basal conditions and also attenuates Rac-1 activation during phagocytosis. In the earlier experiments, we found that Rac-1 activation is enhanced in HMGB1 knockdown cells both under basal conditions and after phagocytosis. Given that Rac-1 activation causes cytoskeletal rearrangement associated with phagocytosis, we used fluorescence microscopy to analyze microtubule organization and actin rearrangement in control and HMGB1 knockdown NIH3T3 cells. As compared with control fibroblasts, we found increased polymerized microtubules, greater cytoplasmic surface area, and enhanced membrane ruffling under baseline conditions in the HMGB1 knockdown NIH3T3 fibroblasts (Fig. 5A). In addition, the HMGB1 knockdown NIH3T3 fibroblasts demonstrated increased formation of spikelike filopodia (Fig. 5B). Enhanced cytoskeletal rearrangement is present after HMGB1 knockdown. A, NIH3T3 cells transfected with pBabe-H1-HMGB1, but with minimal HMGB1 knockdown (Ctrl), and NIH3T3 cells with HMGB1 knockdown (HMGB1-KD) were fixed and permeabilized. The cells were then incubated with primary anti–α-tubulin and anti-HMGB1 Abs, followed by incubation with fluorescence-conjugated secondary Abs. DAPI was used to stain nuclei. B, Experiments were performed as in A, except that the primary anti–α-tubulin Ab was replaced with phalloidin for staining of F-actin. The arrows show microspikes and filopodia. C and D, Murine BMDMs were transfected with control siRNA or siRNA to HMGB1. At 72 h after transfection, the cells were fixed, permeabilized, and stained as in A and B for imaging. E, Murine BMDMs were transfected with control siRNA or HMGB1 siRNA. At 72 h after transfection, the cells were incubated without or with pHrodo-labeled apoptotic thymocytes (red fluorescence) for 1 h. The cells were then washed thoroughly to remove uningested thymocytes and fixed, permeabilized, and stained with FITC-conjugated phalloidin for identification of F-actin (green fluorescence). Original magnification ×100. To confirm the cytoskeletal changes found in fibroblasts after knockdown of HMGB1, we analyzed microtubule organization and actin rearrangement in control and HMGB1 knockdown BMDMs. As shown in Fig. 5C and 5D, and consistent with the findings in fibroblasts, HMGB1 knockdown BMDMs demonstrated increases in polymerized active microtubule rearrangement, cytoplasmic surface area, membrane ruffling, and formation of spikelike filopodia. Of note, the ingestion of apoptotic cells increased membrane ruffling and formation of filopodia, a phenomenon that was enhanced in HMGB1 knockdown BMDMs during the phagocytosis of apoptotic cells (Fig. 5E). The FAK is a nonreceptor tyrosine kinase that plays an important role in cytoskeleton dynamics by activating Elmo-1/DOCK 80/CrkII and ERK, thereby leading to Rac-1 activation, cytoskeleton rearrangement, membrane ruffling, and filopodia formation, which are central processes for the engulfment of extracellular targets (35–40). Given our results showing enhanced Rac-1 activity in HMGB1 knockdown fibroblasts, we next examined signaling events upstream of Rac-1 activation, including activation of the kinases Src, FAK, and Erk in control and HMGB1 knockdown NIH3T3 fibroblasts. We found that phosphorylation of Src at Ser 416 is unaffected by HMGB1 knockdown and also remains unchanged during phagocytosis of apoptotic thymocytes (Fig. 6A). However, phosphorylation of FAK at Tyr 397 is enhanced in HMGB1 knockdown cells under basal conditions and after phagocytosis of apoptotic cells (Fig. 6A, 6C). Phosphorylation of FAK at Tyr 397 was transiently increased during phagocytosis of apoptotic thymocytes in control fibroblasts but was consistently present at increased levels in HMGB1 knockdown fibroblasts during phagocytosis (Fig. 6A). Of note, some of the phosphorylated FAK appeared to be located in the filopodia (Fig. 6C), suggesting that the enhanced FAK phosphorylation after HMGB1 knockdown may promote binding and engulfment of apoptotic cells. HMGB1 knockdown affects FAK, Src, and ERK1/2 activation during phagocytosis. A, NIH3T3 cells transfected with pBabe-H1-HMGB1, but with minimal HMGB1 knockdown (Ctrl), and NIH3T3 cells with HMGB1 knockdown (HMGB1-KD) were incubated with apoptotic thymocytes for the indicated time periods, then washed to remove uningested thymocytes. The cells were then collected and cell extracts prepared for Western blotting to determine levels of phosphorylation of FAK, Src, and ERK1/2. The blots were then stripped and levels of total FAK, total Src, and total ERK1/2 determined. Densitometric analysis was performed, and the ratios of phosphorylated Src/total Src, phosphorylated FAK/total FAK, and phosphorylated ERK1/2/total ERK1/2 were calculated. The value of respective phosphorylated kinase/total kinase for the control fibroblasts without ingestion of apoptotic thymocytes (con at 0 min) was regarded as 1. The values in other conditions were the ratio to that of the “con” at 0 min. Representative blots from three independent experiments are shown. B, Murine BMDMs were transfected with control siRNA or HMGB1 siRNA. At 72 h after transfection, the cells were incubated with apoptotic thymocytes for the indicated times. The cells were then washed and cell extracts prepared for Western blotting to determine levels of phosphorylation of ERK1/2. The blots were then stripped and levels of total ERK1/2 determined. C, Control NIH3T3 (Ctrl) and stable HMGB1 knockdown (HMGB1) lines were incubated with pHrodo-labeled apoptotic thymocytes (red fluorescence) for 1 h. The cells were then washed thoroughly to remove uningested thymocytes and fixed, permeabilized, and stained with phosphorylated FAK Ab, followed by Alexa Fluor 488-conjugated secondary Ab (green fluorescence). Nuclei were stained with DAPI (blue). Representative images are shown. Original magnification ×100. Phosphorylation of FAK at Tyr 397 enhances its kinase activity, thereby leading to an increase in FAK downstream events, such as ERK activation. As expected, given the increase in FAK phosphorylation in HMGB1 knockdown NIH3T3 fibroblasts, we found that phosphorylation of Erk was enhanced under basal conditions in HMGB1 knockdown cells. Although phosphorylation of Erk was transiently increased during phagocytosis of apoptotic thymocytes in control fibroblasts, it remained at increased levels in HMGB1 knockdown fibroblasts during phagocytosis (Fig. 6A). The enhanced Erk phosphorylation found in HMGB1 knockdown fibroblasts was also observed in HMGB1 knockdown macrophages (Fig. 6B). Although our experiments showing enhanced phosphorylation of FAK in fibroblasts with knockdown of HMGB1 suggest that Src kinase activity is increased under such conditions, there is no evidence that the Src kinase is directly involved in the increased phagocytic activity present after reduction in intracellular HMGB1 levels. To examine this issue, we pretreated control and HMGB1 knockdown fibroblasts with PP2, a specific inhibitor of Src kinase activation (41). As shown in Fig. 7A, PP2 dose-dependently inhibited the phagocytosis of apoptotic thymocytes by control fibroblasts, consistent with a role for Src activation in facilitating phagocytosis. Of note, PP2 treatment abrogated the enhanced phagocytic activity of HMGB1 knockdown fibroblasts. These data indicate that the increase in phagocytosis present after reduction in intracellular HMGB1 levels results from increased Src kinase activity, and suggest that HMGB1 may be able to directly inhibit Src activation or the ability of Src to phosphorylate downstream targets, such as FAK, during phagocytosis. The increase in phagocytic activity associated with HMGB1 knockdown is dependent on Src kinase activity. A, NIH3T3 cells transfected with pBabe-H1-HMGB1, but with minimal HMGB1 knockdown (Ctrl), and NIH3T3 cells with HMGB1 knockdown (HMGB1-KD) were pretreated with increasing doses of PP2, a specific Src kinase inhibitor, for 1 h. The cells were then incubated with apoptotic thymocytes for another hour and phagocytosis activity determined. Experiments were performed in triplicate. Means ± SD are shown. B, Levels of FAK and ERK phosphorylation in NIH3T3 cells transfected with pBabe-H1-HMGB1, but with minimal HMGB1 knockdown (Ctrl), and NIH3T3 cells with HMGB1 knockdown (KD) cultured with or without PP2 and incubated with or without apoptotic thymocytes. C, Levels of FAK and ERK phosphorylation in BMDMs transfected with control siRNA or HMGB1 siRNA cultured with or without PP2 and incubated with or without apoptotic thymocytes. A representative experiment is presented. A second experiment provided similar results. To confirm that inhibition of Src reduces the activation of FAK and Erk during phagocytosis, control fibroblasts and HMGB1 knockdown fibroblasts were pretreated with PP2 and then were incubated with apoptotic thymocytes. As shown in Fig. 7B, PP2 treatment diminished basal phosphorylation of FAK and Erk in both control and HMGB1 knockdown cells even before exposure to apoptotic cells. Furthermore, PP2 pretreatment attenuated to a similar extent the enhanced phosphorylation of FAK and Erk that occurred in control and HMGB1 knockdown fibroblasts during phagocytosis of apoptotic thymocytes. These data suggest that the enhanced phosphorylation of FAK and Erk in HMGB1 knockdown cells is directly mediated by Src kinase. Of note, the effects of PP2 treatment on Src activity demonstrated in fibroblasts were also observed in HMGB1 knockdown macrophages (Fig. 7C). In the earlier experiments, we found that phosphorylation of Src is unaffected by knockdown of HMGB1 under basal conditions or during phagocytosis, whereas the phosphorylation of FAK, a Src-mediated event, is increased in HMGB1 knockdown cells. Because association of Src with FAK results in FAK phosphorylation and activation (42, 43), these results suggest that a mechanism by which HMGB1 could affect FAK activation is by modulating the association of Src with FAK. In particular, the ability of HMGB1 to modulate FAK phosphorylation without altering Src activation could be mediated through binding of HMGB1 to Src with resultant inhibition of interaction between Src and FAK. To examine this hypothesis, we performed immunoprecipitation assays using anti-HMGB1 or anti-Src Abs. In these experiments, we found that HMGB1 interacts with Src in fibroblasts (Fig. 8A, 8B). Furthermore, we found that the interaction between Src and FAK in the cytoplasm of HMGB1 knockdown fibroblasts is enhanced compared with that present in control fibroblasts (Fig. 8C). Finally, under in vitro conditions, the presence of HMGB1 diminished interactions between purified FAK and Src (Fig. 8D). These data suggest that cytoplasmic HMGB1, under normal conditions, has an inhibitory effect on the association of Src with FAK, thereby downregulating FAK phosphorylation by Src. In contrast, when intracellular levels of HMGB1 are decreased, interactions between Src and FAK are increased, leading to greater FAK activation and FAK-mediated phagocytosis. 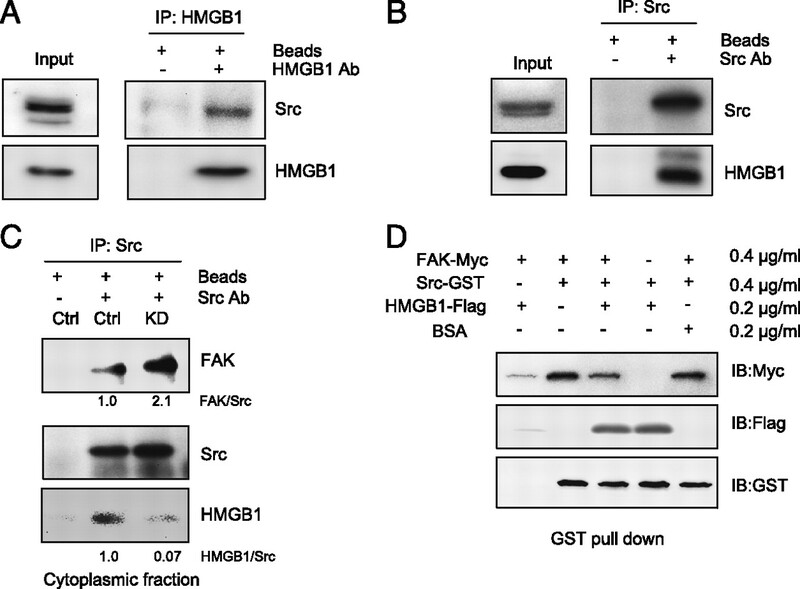 HMGB1 directly interacts with Src and regulates association between FAK and Src. A and B, Cell lysates (500 μg) of NIH3T3 mouse fibroblasts were incubated with anti-Src Ab (2 μg) (A) or anti-HMGB1 Ab (2 μg) (B) overnight. Immunocomplexes were precipitated by incubation with protein G-agarose beads for 2 h. Cell lysates incubated without Abs, but with protein G-agarose beads, were used as a negative control. Levels of HMGB1 and Src in the immunocomplexes were determined by Western blotting. C, Cytoplasmic fractions (500 μg) of the control and HMGB1 knockdown NIH3T3 fibroblasts were incubated with anti-Src Ab overnight followed by immunoprecipitation. Cell lysates not exposed to anti-Src Ab, but incubated with protein G-agarose beads, were used as negative controls. The levels of Src and FAK in the immunocomplexes were determined by Western blotting. D, Recombinant Src-GST protein was incubated with FAK1 Myc in the presence of BSA or of HMGB1-Flag for 1 h. Immunoprecipitation followed by Western blotting was performed to determine the association of the various proteins. Representative gels are shown. Similar results were obtained from a second independent experiment. These studies demonstrate a novel role for HMGB1 in the regulation of phagocytosis. In particular, we found that intracellular HMGB1, through associating with Src kinase and inhibiting interactions between Src and FAK, diminishes the ability of macrophages and other phagocytic cell populations to ingest apoptotic cells. Our previous studies showed that interaction between extracellular HMGB1 and macrophages inhibits the uptake of apoptotic cells, a process called efferocytosis, through mechanisms that involved binding of HMGB1 to phosphatidylserine on the apoptotic cell surface, and to the αVβ3 integrin and the receptor for advanced glycation end products on the macrophage (17–19). These experiments demonstrate a generalized ability of intracellular HMGB1 to diminish the phagocytic activity of various cell populations, including macrophages and fibroblasts. In these studies, there was significant upregulation of target ingestion by cells in which intracellular levels of HMGB1 had either been transiently decreased with siRNA or stably diminished through transfection with an HMGB1 short hairpin RNA construct. The initial steps in phagocytosis involve Src-induced phosphorylation and activation of FAK, ultimately leading to activation of Rac-1, ERK, actin polymerization, and cytoskeletal rearrangement. As localization of both Src and FAK is primarily cytoplasmic (42, 44–46), the interaction between Src and HMGB1 found in these experiments is likely to occur in the cytoplasm. Although HMGB1 was initially characterized as a nuclear DNA-binding protein that participated in the regulation of transcription, these experiments demonstrate a cytoplasmic role for HMGB1 in binding to Src and modulating the activation of phagocytic cells under baseline conditions. Previous studies (13, 14) have shown that HMGB1 shuttles between the nucleus and cytoplasm under basal conditions, thereby providing a mechanism by which HMGB1 may gain access to cytoplasmic proteins, such as Src. Indeed, we found detectable HMGB1 in the cytoplasm of resting macrophages. As shown in these experiments, constitutive interaction of Src and HMGB1 prevents access of Src to FAK, thereby inhibiting FAK phosphorylation and activation, as well as downstream events associated with cytoskeletal reorganization and phagocytosis. The induction of autophagy is associated with reduced phagocytic activity of macrophages (47). Recent studies have demonstrated that increased cytoplasmic concentrations of HMGB1 lead to the initiation of autophagy through binding of HMGB1 to Beclin-1, thereby inhibiting complex formation between Bcl-2 and Beclin-1 (20). Although it is possible that the inhibitory actions of intracellular HMGB1 on phagocytosis are due, in part, to its regulation of autophagy, these studies, showing that Src blockade with PP2 reverses the enhancing effects of HMGB1 knockdown on phagocytosis, indicate that interaction with HMGB1 with Src is a more potent mechanism for the modulation of phagocytosis by HMGB1. Previous studies have shown that HMGB1 is actively secreted by macrophages and other cell populations after they are activated through engagement of TLR, including TLR2 and TLR4, exposure to oxidants, or metabolic stresses (13, 20, 24, 25, 48). In these experiments, we found that phagocytosis also led to an increase in cytoplasmic levels of HMGB1 and secretion of HMGB1 into the extracellular milieu. The role of intracellular HMGB1 as a negative regulator of phagocytosis, as well as the actions of extracellular HMGB1 in diminishing the uptake and clearance of apoptotic neutrophils (17), provide novel mechanisms by which HMGB1 may contribute to the perpetuation and severity of inflammatory responses. In particular, the enhanced cytoplasmic concentrations of HMGB1 that occur in macrophages activated by TLR2 and TLR4 engagement, as well as by other pathways associated with infection, may diminish phagocytosis of bacteria and other microorganisms, allowing their continued proliferation. Similarly, the ability of both intracellular and extracellular HMGB1 to decrease the uptake and clearance of apoptotic neutrophils and other cell populations can lead to exacerbation of inflammation and tissue injury through allowing the apoptotic cells to progress to necrosis with associated release of proinflammatory intracellular contents into the extracellular milieu. These studies, demonstrating that HMGB1 diminishes the phagocytic activity of macrophages and other cells through interactions with Src that then affect FAK activation, suggest that therapeutic approaches directed at inhibiting interactions between Src and HMGB1 or at directly activating FAK, and thereby bypassing the ability of HMGB1 to prevent Src-mediated activation of FAK, may have beneficial effects in infection and inflammation. In particular, enhancing the activity of macrophages and other phagocytes through reducing the inhibitory effects of HMGB1 on phagocytosis would be expected not only to lead to increased uptake of bacteria and other microbes producing infection, but also may hasten the resolution of inflammation through facilitating clearance of proinflammatory cell fragments, as well as of activated neutrophils. Although therapeutic interest has centered on neutralizing extracellular HMGB1 in inflammatory states associated with sepsis and autoimmune disease, these experiments suggest that diminishing cytoplasmic levels of HMGB1 may also be beneficial in these pathophysiologic settings. This work was supported by National Institutes of Health Grants GM087748, HL105473, HL076206, and HL097218.
. 1990. Colocalization of F-actin and talin during Fc receptor-mediated phagocytosis in mouse macrophages. J. Exp. Med. 172: 1853–1856.
. 2006. CRIg: a macrophage complement receptor required for phagocytosis of circulating pathogens. Cell 124: 915–927.
. 2006. Host-pathogen interactions. Curr. Opin. Immunol. 18: 371–373.
. 2010. Phagocyte partnership during the onset and resolution of inflammation. Nat. Rev. Immunol. 10: 427–439.
. 1999. Mechanisms of phagocytosis in macrophages. Annu. Rev. Immunol. 17: 593–623.
. 2007. Journey to the grave: signaling events regulating removal of apoptotic cells. J. Cell Sci. 120: 2143–2149.
. 2001. Actin dynamics during phagocytosis. Semin. Immunol. 13: 347–355.
. 2009. Signalling pathway involving GULP, MAPK and Rac1 for SR-BI-induced phagocytosis of apoptotic cells. J. Biochem. 145: 387–394.
. 2010. High-mobility group box 1 and cancer. Biochim. Biophys. Acta 1799: 131–140.
. 1993. A signature for the HMG-1 box DNA-binding proteins. Bioessays 15: 539–546.
. 2006. Nucleocytoplasmic shuttling of HMGB1 is regulated by phosphorylation that redirects it toward secretion. J. Immunol. 177: 7889–7897.
. 2003. Association of chromatin proteins high mobility group box (HMGB) 1 and HMGB2 with mitotic chromosomes. Mol. Biol. Cell 14: 3414–3426. 2003. Priming the nucleosome: a role for HMGB proteins? EMBO Rep. 4: 131–136.
. 2010. The C-terminal acidic tail is responsible for the inhibitory effects of HMGB1 on efferocytosis. J. Leukoc. Biol. 88: 973–979.
. 2010. HMGB1 inhibits macrophage activity in efferocytosis through binding to the alphavbeta3-integrin. Am. J. Physiol. Cell Physiol. 299: C1267–C1276.
. 2008. High mobility group protein-1 inhibits phagocytosis of apoptotic neutrophils through binding to phosphatidylserine. J. Immunol. 181: 4240–4246.
. 2010. 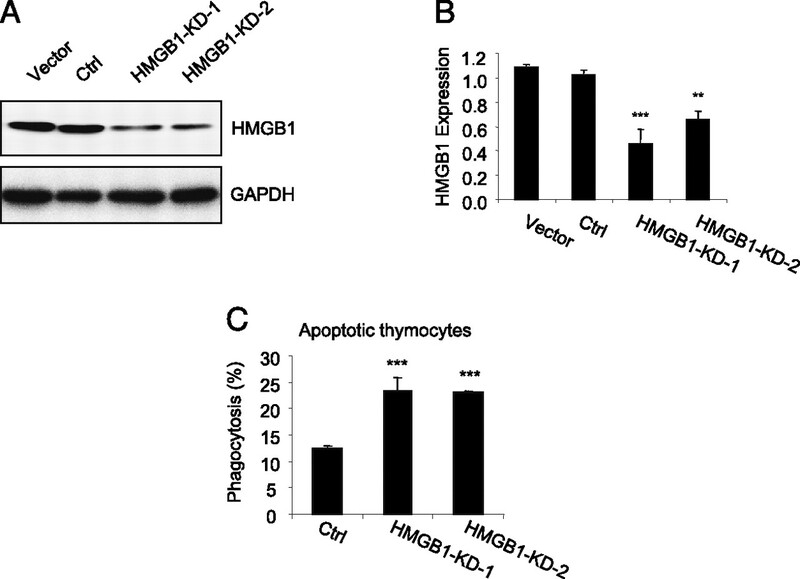 Endogenous HMGB1 regulates autophagy. J. Cell Biol. 190: 881–892.
. 2008. Eating for good health: linking autophagy and phagocytosis in host defense. Autophagy 4: 607–611.
. 2007. Differential susceptibility of bone marrow-derived dendritic cells and macrophages to productive infection with Listeria monocytogenes. Cell. Microbiol. 9: 1397–1411.
. 2001. Transcriptional mechanisms of bone morphogenetic protein-induced osteoprotegrin gene expression. J. Biol. Chem. 276: 10119–10125.
. 2002. The nuclear protein HMGB1 is secreted by monocytes via a non-classical, vesicle-mediated secretory pathway. EMBO Rep. 3: 995–1001.
. 2009. Non-histone nuclear factor HMGB1 is phosphorylated and secreted in colon cancers. Lab. Invest. 89: 948–959.
. 2001. New EMBO members’ review: the double life of HMGB1 chromatin protein: architectural factor and extracellular signal. EMBO J. 20: 4337–4340. 2001. Rho proteins: linking signaling with membrane trafficking. Traffic 2: 303–310.
. 1997. Requirements for both Rac1 and Cdc42 in membrane ruffling and phagocytosis in leukocytes. J. Exp. Med. 186: 1487–1494.
. 2000. Function of Rho family proteins in actin dynamics during phagocytosis and engulfment. Nat. Cell Biol. 2: E191–E196.
. 2008. Apoptosis in the lung: induction, clearance and detection. Am. J. Physiol. Lung Cell. Mol. Physiol. 294: L601–L611.
. 2007. Engulfment of apoptotic cells: signals for a good meal. Nat. Rev. Immunol. 7: 964–974.
. 2001. CED-12/ELMO, a novel member of the CrkII/Dock180/Rac pathway, is required for phagocytosis and cell migration. Cell 107: 27–41.
. 2009. Focal adhesion kinase regulates pathogen-killing capability and life span of neutrophils via mediating both adhesion-dependent and -independent cellular signals. J. Immunol. 183: 1032–1043.
. 2008. Phosphorylation of p130Cas initiates Rac activation and membrane ruffling. BMC Cell Biol. 9: 50.
. 2011. EGF-induced ERK-activation downstream of FAK requires Rac1-NADPH oxidase. J. Cell Physiol. 226: 2267–2278.
. 2007. Filopodia act as phagocytic tentacles and pull with discrete steps and a load-dependent velocity. Proc. Natl. Acad. Sci. USA 104: 11633–11638.
. 2007. Distinct signalling pathways promote phagocytosis of bacteria, latex beads and lipopolysaccharide in medfly haemocytes. Immunology 121: 314–327.
. 1996. Discovery of a novel, potent, and Src family-selective tyrosine kinase inhibitor. Study of Lck- and FynT-dependent T cell activation. J. Biol. Chem. 271: 695–701.
. 2004. FAK-Src signalling through paxillin, ERK and MLCK regulates adhesion disassembly. Nat. Cell Biol. 6: 154–161.
. 2009. Src family kinases are necessary for cell migration induced by extracellular HMGB1. J. Leukoc. Biol. 86: 617–623.
. 1993. Differential localization patterns of myristoylated and nonmyristoylated c-Src proteins in interphase and mitotic c-Src overexpresser cells. J. Cell Sci. 105: 613–628.
. 2004. Src family kinases, key regulators of signal transduction. Oncogene 23: 7906–7909.
. 2005. Focal adhesion kinase: in command and control of cell motility. Nat. Rev. Mol. Cell Biol. 6: 56–68.
. 2011. Phagocytosis is inhibited by autophagic induction in murine macrophages. Biochem. Biophys. Res. Commun. 405: 604–609.
. 2004. Regulation of phagosome maturation by signals from toll-like receptors. Science 304: 1014–1018.